Campground Signs Keep Hikers and Campers Safe! There are few things in this world that are more enjoyable than camping. To get away from the hustle and bustle of urban life for a few days and live in the wilderness is a priceless activity. However, as fun as it is to wake up surrounded by mountains, there are dangers that come with it. 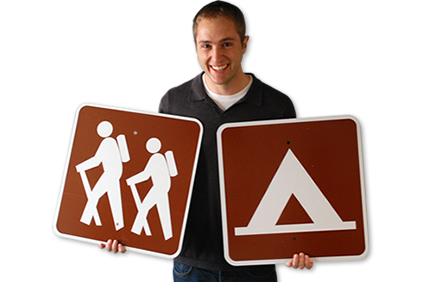 CampgroundSigns.com is the only site on the web dedicated to just selling Campground Signs. As a campsite host, a forest ranger, or a national parks regulator the safety of your visitors is your top priority. Of course, the point of having open wilderness areas is make nature and all of its beauty accessible to the public. But, you want to be sure that people are not getting injured by an unknown and/or avoidable danger. Whether your campers are hiking along a trail, building a campfire or going swimming, make sure that they know the rules. 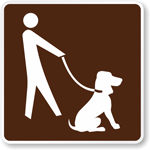 CampgroundSigns.com offers everything you need to make your campsite safe, accessible and fun. We sell nearly 400 different signs with everything including but not limited to Trail Signs, Campfire Signs, Campground Registration Signs, Fishing Signs, Hunting Signs, and signs for ATVs. Our MUTCD signs meet all of the latest safety regulations and are durable enough to do so for up to a decade. All of our heavy-duty aluminum signs are guaranteed to last for 10 years outdoors, but in practice they usually last longer. Our signs are made from the toughest 3M aluminum material around with varying grades of reflectivity (Engineer, High-Intensity, and Diamond). This way, your Campground sign gets noticed any time of the day and will even be visible during severe weather storms. They are so tough that even heavy rain or snow won’t make them rust. At CampgroundSigns.com, it is our goal to make sure you have everything you need to make camping safe and fun. We know that with our huge selection of signs, camping at your site will always be enjoyable and safe. As always, do not hesitate to give us a call if you have any questions about our products or need any help with your order.